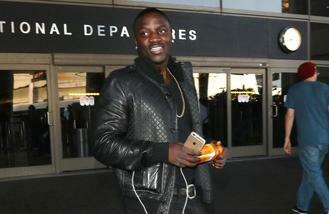 Akon has reportedly been sued over missing royalties. The 'Smack That' rapper has been accused of avoiding to pay producer Leland Clopton, who claims he hasn't been reimbursed for several songs he has written for him over the years since they started working together in 2008. He also claims Akon has been making bosses at his label Konvict Entertainment - now known as Konvict Kartel - hide his accounts so he could not track payments. According to TMZ, Clopton states Akon has been keeping the money for himself and he has accused the 43-year-old musician of a "pattern of racketeering activity". The lawsuit obtained by the gossip website, states he is asking for a $1 million payout from the 'Lonely' hitmaker and he is also demanding Akon - whose real name is Aliaune Damala Badara Thiam - terminates his contract. Meanwhile, Akon previously said he had "no regrets" about not choosing to sign Drake to his label. The 'Locked Up' star - who is responsible for kick-starting the career of global superstar Lady Gaga, who he helped sign a joint deal with Interscope Records and his own KonLive Distribution - turned down taking on the 'Hotline Bling' rapper because at the time he felt the star wasn't "as developed" as he his now. Asked if he regretted not signing him, Akon shared: "No I never regret things like that, there are going to be some things that pass you by that you miss. "Unfortunately at the time when I had the opportunity to sign Drake he wasn't as developed as he is today. At the time when I spoke to him, he was at the developmental stages and also I had never met him in person. "His demo was brought to me by Kardinal Offishall, who I was signed to my label at the time, who I had the number one record 'Dangerous' with. "It was all done in an area of the timing just wasn't there." Metallica's Lars Ulrich is a huge fan of "next level" Rihanna. Marc Anthony has yet to file for divorce from estranged wife Shannon De Lima, according to his father. Tina Turner has given the thumbs up to a planned West End musical about her life. Robin Thicke's mother Gloria Loring is giving the singer some "quiet time" to grieve the loss of his actor father Alan Thicke. Joe, Nick and Kevin Jonas are set to star in a TV special documenting the launch of their family restaurant. Pop star Ricky Martin gave his two sons an early Christmas treat by taking them to Disneyland on Tuesday (13Dec16). FKA Twigs has launched a new website that features an archive of all of her work to date. Busted want to perform at Glastonbury Festival. Naughty Boy is working on George Michael's solo comeback album.